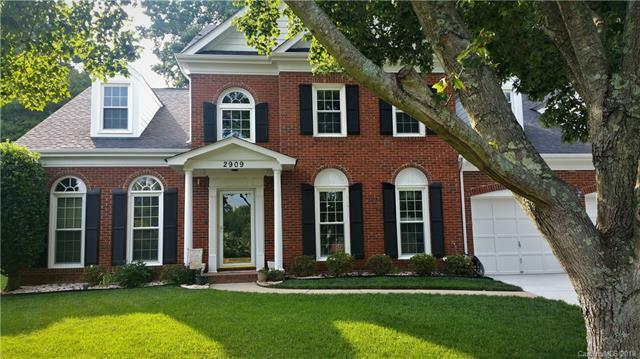 Located within popular Matthews Plantation subdivision, this wonderful brick home on a quiet cul-de-sac, located within of 5 minutes of Publix, Harris Teeter and Squirrel Lake Park. The neighborhood boasts a well-maintained common area, consisting of a large beautiful pond, surrounded by picnic tables, tennis courts and a playground for children.This home features an oversize master bedroom suite, located on the 1st floor, with three additional large bedrooms upstairs. The spa-like master bathroom was recently remodeled, and the large walk-in closet provides ample storage. Large mature trees provide lots of shade for grilling out in the private backyard setting. The kitchen features stainless steel Samsung appliances and laundry is located near the master, and conveniently just off the kitchen. Additional storage is found in the walk-in attic,the storage room inside the large two car garage, and within the attached storage room, accessible from the side yard.